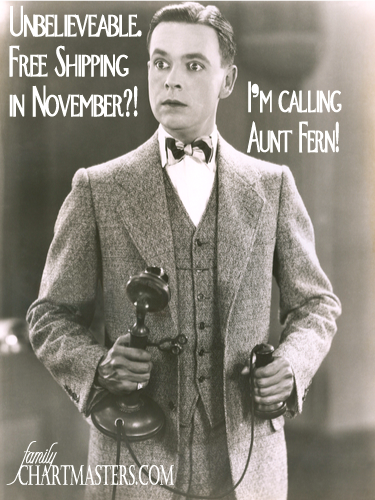 We've never done free shipping on orders within the US before, but we are feeling really generous for the month of November. If you want to pay full price for shipping you can, but be sure to send the check to Janet and mark it "Christmas Bonus for Erin, Wendy, and Christine." Otherwise, just mention coupon code FREETOUSA to receive your free shipping. This offer is good for any working or decorative charts that we design. If you need ideas for your chart, check out our new and improved chart gallery or give us a call at 801.87.CHART (801.872.4278.) We'd be happy to chat with you.